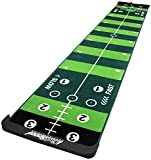 When you combine arcade skee-ball with a miniature golf putting green, you get this cool new Putting Arcade. 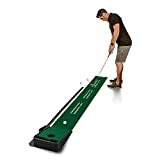 This fun portable putting game lets players take turns putting golf balls along a six foot grass green and up into one of five scoring holes, just like the classic skee-ball game. Balls are automatically returned along a ramp, but unfortunately you don't win tickets to exchange for cheap prizes. 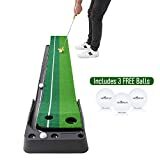 Includes a 35" putter club and 12 balls.